The heavens smiled on me today. A seventy percent chance of showers, the weather forecast read. 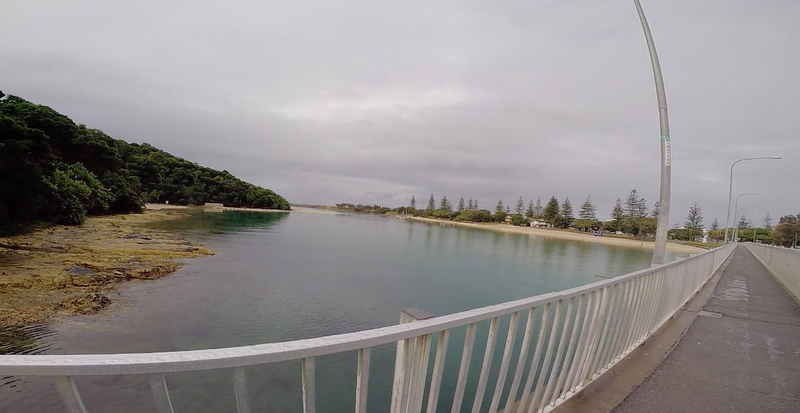 Hmm, I have some people to meet for coffee this morning at Burleigh Heads, almost seven kilometres away. It wasn’t an essential, must-go-to-at-all-costs type of meeting. It sprang from bumping into a friend over the weekend, realising it’d been a long time since we’d chatted, and followed with an invitation to join in for a catch-up with another mutual friend. Sounds great! And it was. But before I got there, I was feeling a little delicate about going out in the rain and turning up damp and ruffled from the ride. Well, ruffled doesn’t really bother me that much. Ruffled can be spruced out with a little attention after parking the bike. Sitting in damp clothes, though, that’s not so easy to fix. It’s okay in summer when the weather is warm and damp clothes can help cool the body. In winter, it’s uncomfortable plus there’s the risk of catching a chill. Thoughts of “do I cancel” ran through my mind. They didn’t last for long though. I’ve been looking forward to catching up. And I realised that if I didn’t ride, then the next cab off the rank, so to speak, in the scope of this experiment, was going to be the bus. There was no reason why I couldn’t take the bus, but you know I’d rather ride. So I packed my pannier with a towel, my felted wool jacket, a beanie and gloves. I also added a flask filled with a green smoothie to drink if I needed extra fuel to keep me warm. It’s starting to sound like the winter is exuding deep cold! But it’s not. The Girl Guide that I never was, just wanted to be prepared. … warm leather boots, skinny cords, and a long sleeve woollen top with a scarf. To stay dry during the ride, I wear my raincoat and rain pants over the top to act as an outer shell. It’s not raining when I start riding but within a kilometre, the drizzle begins. 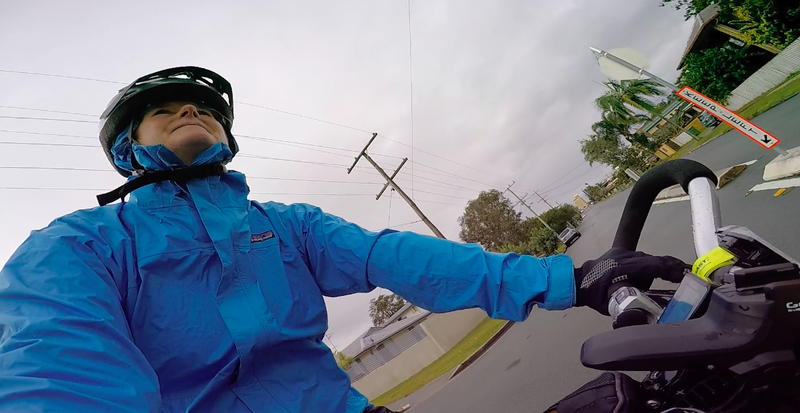 I stop under the canopy of a tree and pull the hood of my raincoat over my head, expand the fit of my bike helmet and squeeze it over the hood. My hair might be a little ruffled when I arrive but it won’t be wet. The drizzle didn’t last long. I made it to the café feeling warm and dry, spruced my ruffled hair, rearranged my scarf and headed in for a lovely time yarning. Chatter. Chatter. Chatter. Rain pours. Umbrellas open and people hurry under them. Riding home. Rain pauses. Pedal. Pedal. Safely home, the clouds open and dump a new dose of winter rain. It might have been a rainy day but not a very rainy ride. Yes, the heavens definitely smiled on me today. 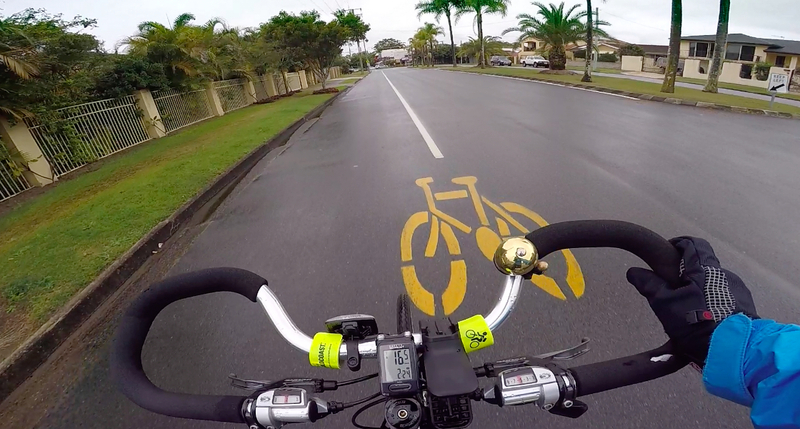 View from my handlebars on a rainy day. Good for you sticking to your guns!! I love reading about your riding experiences! Hey thanks Roz! So good to know they’re being enjoyed. Well done Gail. Whenever I feel hesitant about riding in the rain, or on chilly mornings, I spare a thought for my older dutch relatives. They had to cope with riding through sleet and snow, and no doubt much colder winds – and probably daily, in the long northern European winters. That usually makes me feel rather pathetic, and I just get on with it!